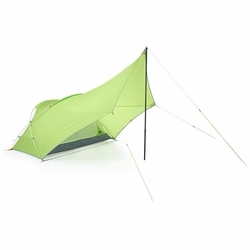 NEMO Front Porch 2P Tent. When it comes to festivals or campsites with a beautiful view, Front Porch™ is a fresh new approach to tent design. Instead of setting up a tarp and tent separately, Front Porch™ combines them into one elegant package. It’s both a sheltered area for hanging out and enjoying the scenery, and a cozy and intimate area to retire to at the end of the night. There’s a smaller vestibule out back for storing extra gear, plus our Light Pockets, lantern loops and everything you need for setup, including the tarp pole.